UP Board Scrutiny Fees 2019: UP Board have increased scrutiny fees for subject marks 10th 12th scrutiny after written examination result. The name of scrutiny derived from verification of marks that he/she expected to get some waivers from State (UP Board, Bihar Board, Rajasthan Board) and Central Board (CBSE Board, ICSE Board, CISCE Board). In Hindi meaning of Scrutiny named as (Sannirikhsa). 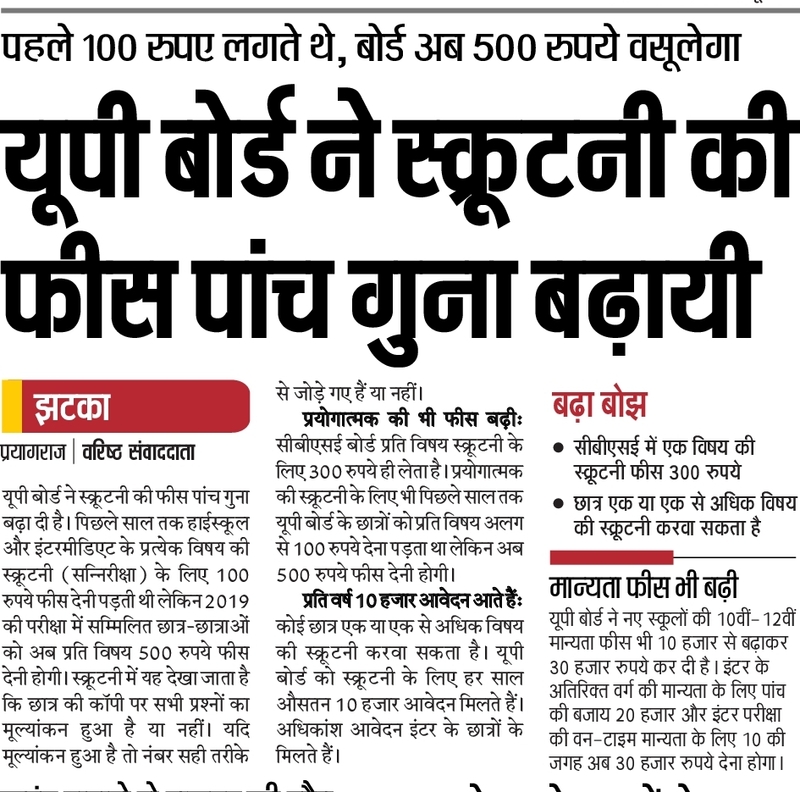 UP Board Scrutiny Charges: Latest News 15 April regarding UP Board scrutiny is Rs 500 will now have to pay by UP Board Students of Class 10th and 12th Subjects. Previous year it was Rs 100 for subjects but now while filling UP Board Scrutiny Application Form whether it is offline or online you may charged to pay Rs 400 extra i.e. Rs 500. How to Check Scrutiny Marks: During Checking of Scrutiny Subjects, Examiners eyes single words, line, paragraph in English Hindi, Social Science Commerce & Sanskrit Type Subjects. In Maths UP Basic Shiksha Parishad has benefited students through waiver on marks on wrong cross answer if it correct and marks will also be added for solving question in right hand side. UP Board Scrutiny Application Form: In these posts you have checked UP Board fees on scrutiny but we have also other posts which have various steps to fill UP Scrutiny application form. CBSE Board Scrutiny Fees 2019: CBSE Board (Central Board of Secondary Education) charged Rs 300 per subject. 1. In UP Board Office every year 10000 application form filled by students on scrutiny. 2. UP 12th Scrutiny Application From: Mostly highest number of application received from intermediate students. UP Board Practical Scrutiny Fees: Per subject UP Board Practical scrutiny fees is Rs 500. So if you have any doubt in correct subject on getting fewer marks than with your duplicate result submit it to UP Board Office Allahabad or ask through help line numbers.